Academic Primary Care, University of Aberdeen, Aberdeen. Background Gynaecological cancers are the second most common female cancer type, with survival rates in the UK lower than in many comparable countries. A potentially important factor in the UK’s poorer cancer outcomes is diagnostic delay; gynaecological cancers are the cancer type most likely to be affected by less timely diagnosis. Aim To examine current evidence for factors that contribute to patient and primary care delays in the diagnostic pathway of gynaecological cancer. Design and setting A systematic review of the available literature. Method PRISMA guidelines were followed. MEDLINE and Embase databases and the Cochrane Library were searched using three terms: primary care; gynaecological cancer; and delay. Citation lists of all identified articles were searched. Two authors independently screened the titles, abstracts, and full texts of publications. Data extraction was performed by one author and quality assured by a second reviewer in a 20% sample of selected articles. Synthesis was narrative. Results A total of 1253 references was identified, of which 37 met the inclusion criteria. Factors associated with delayed diagnosis were categorised as either patient factors (patient demographics, symptoms or knowledge, and presentation to the GP) or primary care factors (doctor factors: patient demographics, symptoms or knowledge, and referral process); and system factors (such as limited access to investigations). Conclusion Delayed diagnosis in the patient and primary care intervals of the diagnostic journey of gynaecological cancer is complex and multifactorial. This review identifies areas of future research that could lead to interventions to enable prompter diagnosis of gynaecological cancers. Research into early diagnosis of cancer is complex. The diagnostic pathway of cancer consists of several discrete stages, from when a patient notices a worrying symptom to the pathological confirmation. 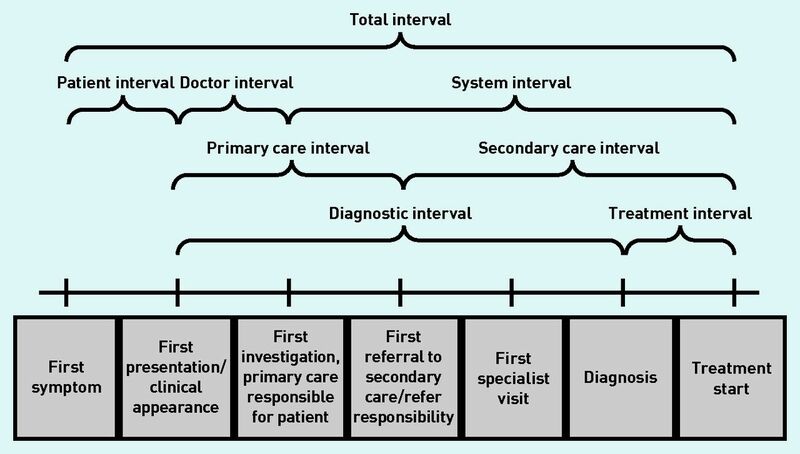 These stages are described in the Aarhus statement (Figure 1).7 Fully understanding each stage could inform effective interventions to reduce overall diagnostic delay. However, there is a paucity of coherent evidence to inform interventions. 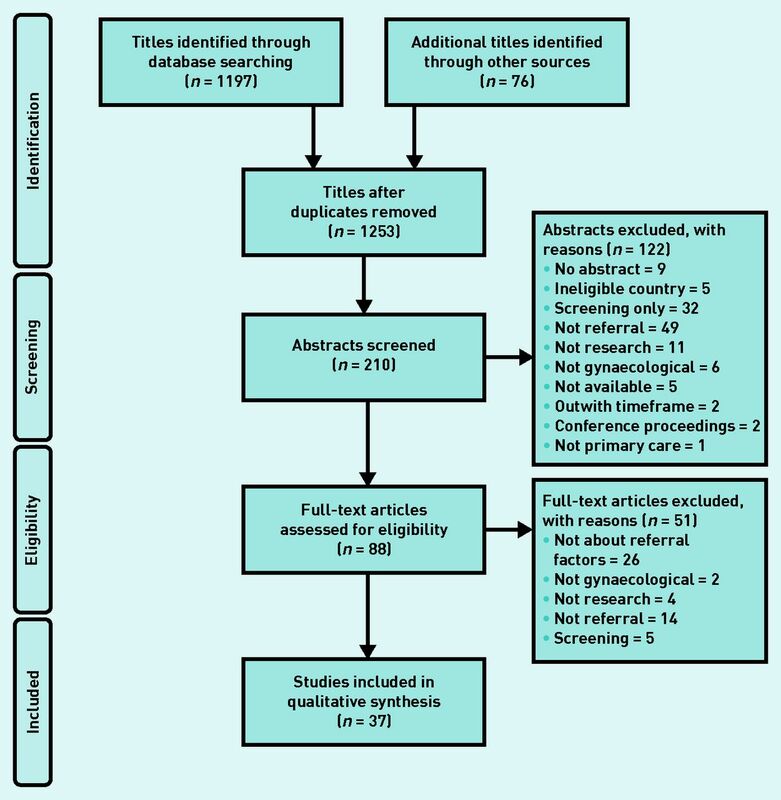 Therefore, this systematic review aimed to address the research question: what factors influence patient and primary care delay in the diagnostic pathway of gynaecological cancer? A systematic narrative review was conducted. A computerised database search was performed in September 2014 and updated on 17 March 2017. The Preferred Reporting Items for Systematic Reviews and Meta-Analyses (PRISMA) criteria were followed. The search strategy included three terms, their synonyms, and MeSH terms: primary care, gynaecological cancer, and diagnosis. The full strategy is available from the authors on request. The Cochrane Library and MEDLINE and Embase databases were searched and citation lists of identified articles were searched manually by one of the authors. All study types from January 2000 to March 2017 were included: controlled and uncontrolled quantitative studies, and qualitative studies. editorials, unpublished work, and academic theses. Despite its prevalence and evidence that it is associated with diagnostic delay, it is not clear which factors are important in the diagnostic pathway of gynaecological cancer. This study shows that diagnostic delay is multifactorial, with a complex interplay of mutually interdependent relationships between patient and primary care factors. Identifying areas of further research, the study also identifies areas where the introduction of a complex intervention has the potential to improve patient outcomes. Titles, abstracts, and full articles were sequentially screened by one author against the inclusion and exclusion criteria. The same author obtained full-text articles for all eligible abstracts. Any disagreements were resolved by discussion between two researchers. Each included article was assessed using the relevant Critical Appraisal Skills Programme (CASP) tool. Well-established CASP tools are validated for the study methodologies included in the review. Data were extracted from eligible articles to a data collection form. The full data collection form is available from the authors on request. Data extraction was performed by one author. Twenty per cent of the articles were independently reviewed by one of two authors. Synthesis was narrative.8 Overarching themes were identified after initial reading. Three main themes emerged inductively after detailed reading. Re-reading of the included articles allowed cross-referencing of data to these themes and development of subthemes. A PRISMA diagram for the systematic review is shown in Figure 2. The search identified 1253 titles; 210 abstracts were screened with 122 being excluded; 88 full text articles were assessed with 37 meeting the inclusion criteria. Full details of the studies are available from the authors on request.9–45 The reasons for abstract and full article exclusions are given in Figure 2. Various methodologies were employed: 15 cohort studies, five retrospective note reviews, four questionnaire studies, three qualitative studies, two mixed methods studies using both qualitative and data analysis, three telephone surveys, one cross-sectional analysis, three secondary data analysis studies, and one review. Poor study quality did not affect inclusion of articles. A detailed cohort quality checklist is available from the authors on request. Initial reading of the data identified three themes that mapped on to the diagnostic intervals described in the Aarhus statement (patient factors, doctor factors, and system factors).7 Further analysis identified subthemes as outlined below. The effect of ethnicity was mixed. Although one author demonstrated black or ethnic minority women in the UK were more likely to require three or more visits to their GPs before referral,19 two demonstrated no link with ethnicity and delay.9,12 Poorer survival rates were observed in black and Latino women in the US,13 and Pacific and Maori women in New Zealand,20 suggesting that other factors, such as cultural attitudes, might influence survival. Seibaek et al 15 suggested that, although patients experience ‘bodily sensations’ such as abdominal distension or pain, it is organisational, cultural, and social factors that determine whether these ‘sensations’ are then interpreted as symptoms that lead to health-seeking behaviour. Many women will put these ‘sensations’ down to menopause or a non-gynaecological cause. Not being referred to gynaecology,35,37 non-urgent referral,26,35 and referring without notifying a suspicion of cancer on the referral12 were all associated with diagnostic delay. Analysis by themes can be limiting and there are some difficulties categorising patient, doctor, and system factors because of their interdependency: some subthemes are embedded in all three major themes. Patient age appears to be an important factor influencing patient and practitioner behaviour. The symptom type is important and an absence of alarm symptoms can lead to delay. Patients and GPs can lack symptom knowledge, which affects patients’ decisions to present and clinicians’ decision to investigate or refer. Non-investigation of symptoms or misdiagnosis can lead to non-urgent referral or referral to specialties other than gynaecology. Communication between GPs and patients and GPs and secondary care also has impact. There was little evidence describing the effect of UK and Danish USCR guidelines. Of the 21 UK studies included in the review, 15 were conducted after the introduction of the guidelines. Misattribution of symptoms by GPs and suboptimal referral were identified before and after guideline introduction.27,33,41 All eight Danish studies were conducted after guidelines were introduced. This review is the first to examine the factors influencing patient and primary care intervals in the diagnostic pathway of gynaecological cancers. It has been conducted rigorously and provides a summary of the available evidence to inform complex interventions to reduce diagnostic delay. There are some limitations. Despite a comprehensive systematic search strategy, a paucity of evidence was identified. Almost all studies were observational and of variable quality. The studies were heterogeneous, varying in terms of cancer type, research methods, and outcomes, with a focus on descriptive work rather than interventions. Variance in the definition of delay and in the healthcare systems investigated led to heterogeneity of patients and practitioners. The lack of common methodology does not permit definitive conclusions. The general diagnostic delay themes identified, such as patient socioeconomic and educational status, symptom knowledge, and misdiagnosis, confirm those described previously by other authors,12,30,46,47 but this review is the first to examine factors specific to gynaecological cancer. This review has identified specific factors that influence patient and primary care diagnostic delay. GPs can be misled by presenting symptoms; they should be alert to gastrointestinal symptoms and abnormal bleeding in premenopausal women, which can lead to misdiagnosis, lack of examination, and suboptimal referral. Another important factor in reducing delay is for GPs to have suspicion that the patient may have cancer. However, because GPs do not see cases of gynaecological cancer often, it is important to work out how they can differentiate between suspicious and non-suspicious vaginal bleeding or recognise the significance of gastrointestinal symptoms while minimising delay. There is a need to understand why patients delay presenting and identify effective education. Pelvic examination appears to be an important factor in reducing delayed diagnosis; therefore, research might be useful to find out how to make it an acceptable procedure to patients in terms of physical and emotional comfort and to GPs in terms of time, chaperone availability, and skills. Communication is key; patients must be reassured that they are not wasting GPs’ time and to come back if symptoms persist or worsen. This work was funded by an NHS Education for Scotland Clinical Academic Fellowship. This article is Open Access: CC BY-NC 4.0 licence (http://creativecommons.org/licenses/by-nc/4.0/). (2014) Cancer survival in Europe 1999–2007 by country and age: results of EUROCARE-5: a population-based study. Lancet Oncol 15(1):23–34. (2014) Saving lives, averting costs. An analysis of the financial implications of achieving earlier diagnosis of colorectal, lung and ovarian cancer. CRUK. (2010) Delayed diagnosis of cancer: thematic review (NPSA, London). (2011) Interventions to reduce primary care delay in cancer referral: a systematic review. Br J Gen Pract, DOI: https://doi.org/10.3399/bjgp11X613160. (2015) Suspected cancer: recognition and referral NG12 (NICE, London). (2014) Scottish referral guidelines for suspected cancer (HIS, Edinburgh). (2006) Guidance on the conduct of narrative synthesis in systematic reviews: a product from the ESRC Methods Programme (ESRC, Lancaster). (2006) Urgent GP referrals for suspected lung, colorectal, prostate and ovarian cancer. Br J Gen Pract 56(526):355–362. (2013) Socio-demographic inequalities in stage of cancer diagnosis: evidence from patients with female breast, lung, colon, rectal, prostate, renal, bladder, melanoma, ovarian and endometrial cancer. Ann Oncol 24(3):843–850. (2005) Sociodemographic factors and delays in the diagnosis of six cancers: analysis of data from the ‘National Survey of NHS Patients: Cancer’ Br J Cancer 92(11):1971–1975. (2010) Diagnostic and therapeutic delays among a multiethnic sample of breast and cervical cancer survivors. Cancer 116(13):3195–3204. (2010) Pathways to the diagnosis of epithelial ovarian cancer in Australia. Med J Aust 193(6):326–330. (2001) Symptom interpretation and health care seeking in ovarian cancer. BMC Women’s Health 11:31. (2011) Socio-demographic factors, comorbidity and diagnostic delay among women diagnosed with cervical, endometrial or ovarian cancer. Eur J Cancer Care 20(5):653–661. (2008) Socioeconomic patient characteristics predict delay in cancer diagnosis: a Danish cohort study. BMC Health Serv Res 8:49. (2016) Gynecological cancer alarm symptoms: is contact with specialist care associated with lifestyle and socioeconomic status? A population-based study. Acta Obstet Gynecol Scand 95(9):976–983. (2012) Which factors account for the ethnic inequalities in stage at diagnosis and cervical cancer survival in New Zealand? Cancer Epidemiol 36(4):e251–e257. (2007) Barriers to early diagnosis of cancer in primary care: a needs assessment of GPs. Ir Med J 100(10):624–626. (2011) Time intervals from first symptom to treatment of cancer: a cohort study of 2,212 newly diagnosed cancer patients. BMC Health Serv Res 11:284. (2014) Variation in promptness of presentation among 10,297 patients subsequently diagnosed with one of 18 cancers: evidence from a National Audit of Cancer Diagnosis in Primary Care. Int J Cancer 135(5):1220–1228. (2016) The association between socioeconomic status and tumour stage at diagnosis of ovarian cancer: a pooled analysis of 18 case-control studies. Cancer Epidemiol 41:71–79. (2012) Symptoms and risk factors of ovarian cancer: a survey in primary care. ISRN Obstet Gynecol doi:10.5402/2012/754197. (2011) Delays in treating endometrial cancer in the South West of England. Br J Cancer 104(12):1836–1839. (2014) Delays in diagnosis of young females with symptomatic cervical cancer in England: an interview-based study. Br J Gen Pract, DOI: https://doi.org/10.3399/bjgp14X681757. (2007) Symptoms, diagnoses, and time to key diagnostic procedures among older U.S. women with ovarian cancer. Obstet Gynecol 109(5):1053–1061. (2011) Reasons for diagnostic delay in gynecological malignancies. Int J Gynecol Cancer 21(6):967–974. (2013) Differences in cancer awareness and beliefs between Australia, Canada, Denmark, Norway, Sweden and the UK (the International Cancer Benchmarking Partnership): do they contribute to differences in cancer survival? Br J Cancer 108(2):292–300. (2010) Are GPs under-investigating older patients presenting with symptoms of ovarian cancer? Observational study using General Practice Research Database. Br J Cancer 102(6):947–951. (2002) Effect of delays in primary care referral on survival of women with epithelial ovarian cancer: retrospective audit. BMJ 324:148. (2005) Delayed diagnosis of cervical cancer in young women. J Obstet Gynaecol 25(4):367–370. (2014) Quality deviations in cancer diagnosis: prevalence and time to diagnosis in general practice. Br J Gen Pract, DOI: https://doi.org/10.3399/bjgp14X677149. (2007) Minimizing delays in ovarian cancer diagnosis: an expansion of Anderson’s model of ‘total patient delay’ Fam Pract 24(1):48–55. (2005) Barriers to effective communication across the primary/secondary interface: examples from the ovarian cancer patient journey (a qualitative study). Eur J Cancer Care 14(4):359–366. (2007) Stage, survival and delays in lung, colorectal, prostate and ovarian cancer: comparison between diagnostic routes. Br J Gen Pract 57(536):212–219. (2014) Comparison of cancer diagnostic intervals before and after implementation of NICE guidelines: analysis of data from the UK General Practice Research Database. Br J Cancer 110(3):584–592. (2016) Time to diagnosis of Type I or II invasive epithelial ovarian cancers: a multicenter observational study using patient questionnaire and primary care records. BJOG 123(6):1012–1020. (2003) The impact of the introduction of a fast track clinic on ovarian cancer referral patterns. Eur J Cancer Care 12(4):327–330. (2011) General practitioner characteristics and delay in cancer diagnosis: a population-based cohort study. BMC Fam Pract 12:100. (2009) Diagnostic delay experienced among gynecological cancer patients: a nationwide survey in Denmark. Acta Obstet Gynecol Scand 88(6):685–692. (2004) Diagnosis and prognosis of breast and ovarian cancer: a population-based study of 234 women. Acta Oncol 43(2):175–181. (2000) Ovarian carcinoma diagnosis. Cancer 89:2068–2075. (1999) Factors predicting delayed presentation of symptomatic breast cancer: a systematic review. Lancet 353:1127–1131.